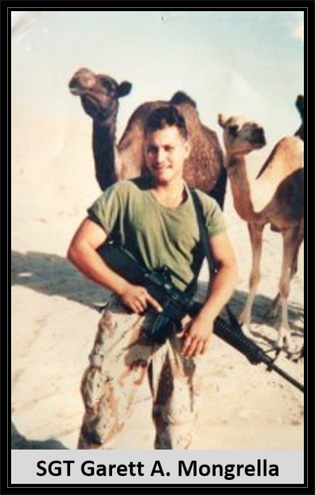 Died: January 29th, 1991, Operation Desert Storm. 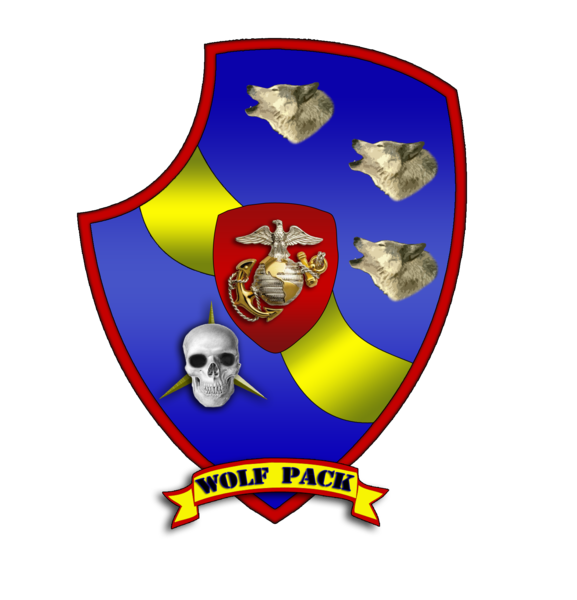 Unit: Delta Co., 3rd Light Armored Infantry Battalion, 1st Marine Division, Twentynine Palms, Calif. Incident: Died of injuries during an engagement with enemy forces around the Saudi border town of Khafji. . The call to the Mongrella home in Belvidere, N.J., came at 3 a.m. Thursday. The message was one they had been dreading: Marine Sgt. Garett A. Mongrella, 25, had been killed during Wednesday's battle to reclaim Khafji, Saudi Arabia, from Iraqi troops. "I had a feeling it was him because I knew he was in that area," Mongrella's father, John Mongrella, said Thursday night in a telephone interview. "When they said two armored vehicles were hit, I knew it was him." Mongrella was one of 11 Marines to die in the first sustained ground fighting of the war. An American military investigative team is trying to determine whether some of the Marines killed in the battle with Iraqi troops were accidentally hit by U.S. or allied forces. Marines and Iraqi ground forces were locked in close combat during much of Wednesday night's fighting, and U.S. Air Force aircraft were called in to provide air support, including missile attacks on Iraqi tanks that had crossed into Saudi Arabia from southwest Kuwait. Mongrella frequently wrote to his family from his post in Saudi Arabia. His father did not have a chance to open the last letter before he learned Thursday that his son was dead. "I can't open it, not now. I'll wait till later," he said. Mongrella left behind his wife, Kim, 25, and 18-month-old son, Anthony. The couple met in 1986 while Mrs. Mongrella was in the Navy, and married two years later. She left the Navy last year. Kim Mongrella said she knew instantly when she saw the Marine officer at the door that her husband had been killed. "It came totally out of the blue," she said Thursday afternoon from Fort Dodge, Iowa, where she is staying with her mother. "I was preparing myself for it, but it was still a surprise. I am glad he went now. I don't think I could handle him being over there a year and then have him killed in action. "Maybe I am a little stronger about this because I was in the military myself," she said. Mrs. Mongrella served in the Navy for four years, ending her duty in February 1989. Garret Mongrella's mother, Loretta, who lives in Netcong, Morris County, N.J., visited her priest, the Rev. James Doyle of St. Michael's Catholic Church, Netcong, yesterday morning to talk and to make arrangements for her son's funeral. "She was pretty much uptight, but well-controlled," said Doyle. "She was very tense, no question. She was concerned for her son, but she was very proud that he was in the service." 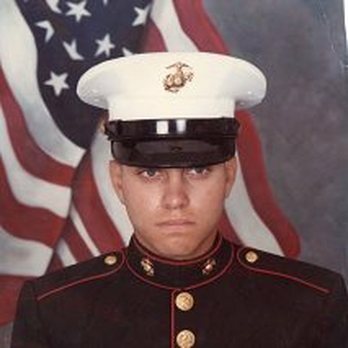 Mongrella joined the Marines after he graduated in 1983 from Lenape Valley Regional High School in Stanhope, Sussex County, N.J. He was assigned to a desk job and played for the base soccer team. But Mongrella pushed for a transfer. "He gave all of it up to be in the infantry; that's what he wanted," his father said. Mongrella was trained for special operations and reconnaissance, moving from Camp Lejeune, N.C., to guard duty on a Navy aircraft carrier, and then to Camp Pendleton, Calif. In late August, his unit left for Saudi Arabia. 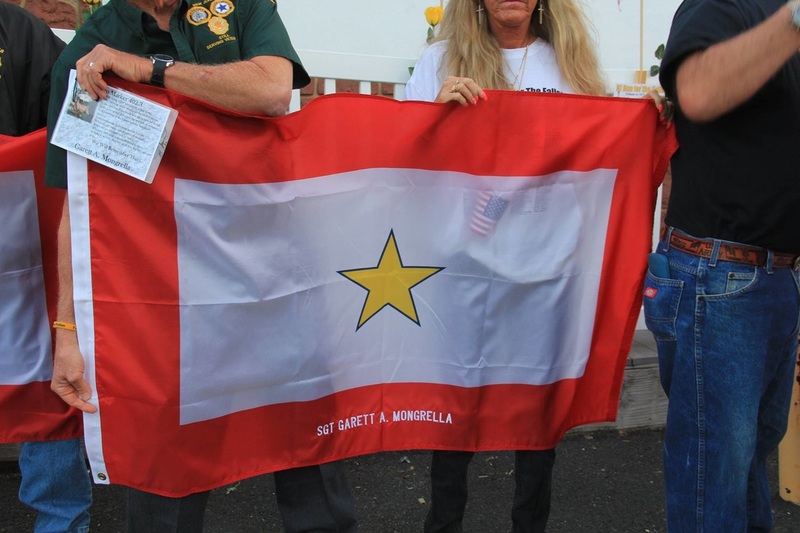 Mongrella was with the 3rd Light Armored Infantry Battalion of the 1st Marine Division. The battalion was based at Twentynine Palms, Calif., said Sgt. 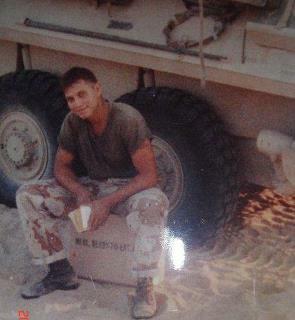 Robert R. Louch at Marine Corps headquarters in Washington, D.C.
"He was a Marine, top to bottom," John Mongrella said. 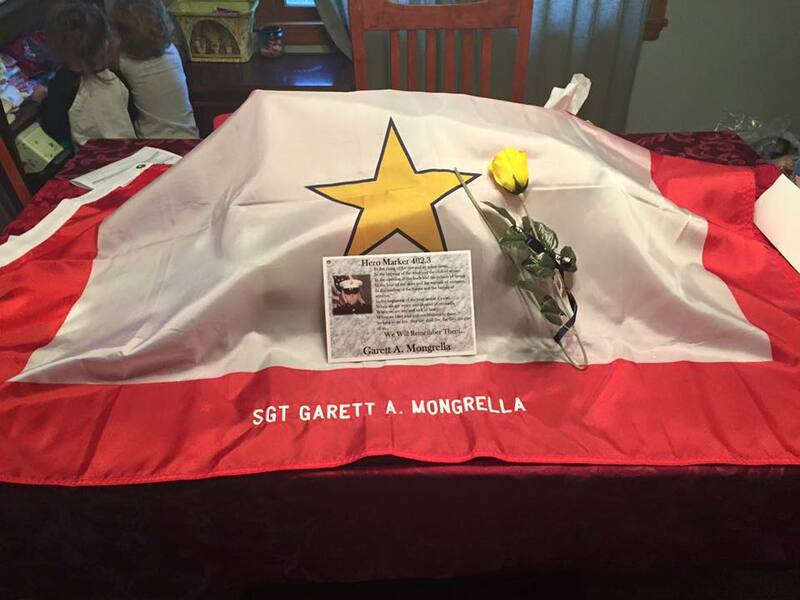 To Lenape Valley Principal James Riccobono and his staff at the school, Mongrella was known as Gary. Riccobono and those who knew Mongrella remembered him fondly. "He had a beautiful smile, and that was Gary," said Riccobono. "When I found out yesterday, I talked to coaches and teachers, and they all said the same thing: his smile. He was so friendly, so outgoing. He was just a good kid, very well-liked. He always had a smile on his face." Riccobono said the mood at the school was one of sadness. "Perhaps the faculty is touched more personally because they knew and dealt with Gary." He said Mongrella was the youngest of four children, with two older sisters and an older brother, all of whom attended the school. Mongrella, a four-year member of the school's soccer program, visited his alma mater after finishing boot camp, Riccobono said. "He was exceptionally proud to be a Marine. He was very gung-ho." Classes began yesterday with the announcement of the tragedy, followed by a moment of silence. "We're hopeful we don't ever have to do this again," said Riccobono. "You think you've seen everything and gone through every circumstance. We know we had youngsters over there and you hope and pray that it doesn't happen, but you know there's always a chance." He said the school has a strong commitment in the Persian Gulf, with 12 graduates stationed there. A special marquee bearing the names and pictures of those graduates has been set up in the school's commons area. "We didn't know Gary was there, so he was not included on our board," said Riccobono. "We only heard that Gary was there early in the week. We were trying to locate his family to add his name." Patricia Lee Haley described her friend Garett Mongrella as a typical "boy next door." 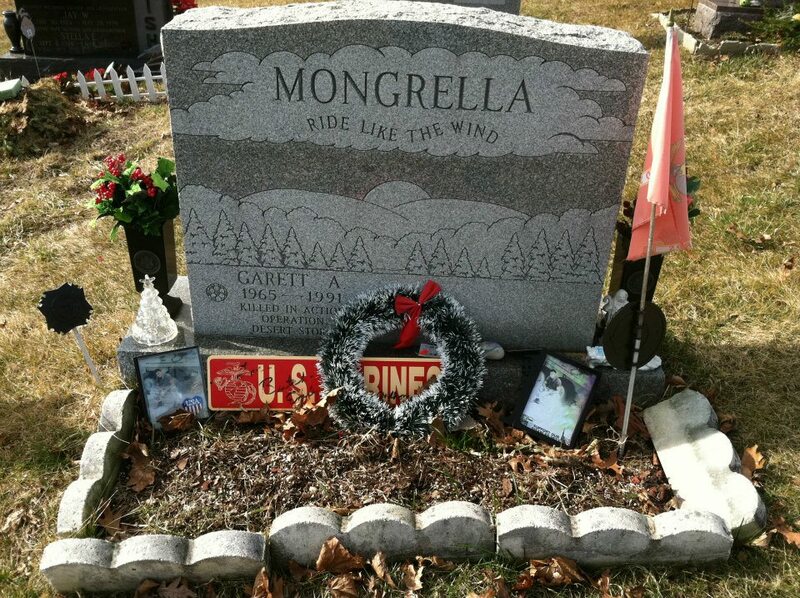 Haley, who as a child lived two doors down from Mongrella in Stanhope, N.J., recalled that Mongrella used to play with toy guns and soldiers as a child. She recalled that he became a soldier immediately after high school, volunteering for the Marines because "that's really what he wanted to do." Haley was one of about 150 friends and family who paid their respects to Mongrella, one of 11 Marines killed last week in the first sustained fighting of the Gulf War, at a Mass yesterday at St. Michael's Catholic Church in Netcong, N.J. Mongrella, 25, who left a wife, Kimberly, and an 18-month-old son, was a sergeant with the 3rd Light Armored Infantry Battalion of the 1st Marine Division, based at Twentynine Palms, Calif.
NOW, THEREFORE, BE IT RESOLVED that the Mayor and Council of the Borough of Stanhope, County of Sussex, State of New Jersey hereby authorizes the placement of a topper sign over the Dell Road street sign in the name of Marine Sgt. Garrett Adam Mongrella honoring his dedication and service to our country.